advice, support and representation for you. commercial areas of legal advice and representation. properties in Lancashire, North West and UK. Looking for a solicitor near you? Need a local solicitor that is experienced and affordable? We have specialist solicitors, who are dedicated to personal law such as divorce, family law, employment law, personal injury & more. We have a team of Lancashire based solicitors who are specialists in business and commercial law support and advice. This includes commercial property, disputes, employment law and commercial litigation. Our local estate agents are on hand to help you buy, sell, rent or let property throughout Lancashire and the UK. We offer a range of property services at highly competitive rates (fixed fee). Contact us today. Solicitor Direct has been established solicitors since 1996 and offer all services you would expect from your solicitor. This includes specialist legal advice, covering various disciplines. Our local solicitors in Leyland can provide professional legal representation at all levels for you and/or for your business. Contact us for a FREE consultation. We have a team of Lancashire based Solicitors who dedicated to the business and commercial areas of legal support, advice and representation. Contact us today. We can help you to buy, sell, let or rent property across Lancashire. Our experienced estate agency team go above and beyond to provide a first class and affordable service. Helping you to buy & sell property. We have helped numerous individuals buy and sell property across Lancashire, Northwest and the UK. Professional service at a low cost rate. Our conveyancing specialists can help you with selling, buying, remortgaging or transferring deeds. Get a FREE instant conveyancing quote today. Local solicitors and estate agents. 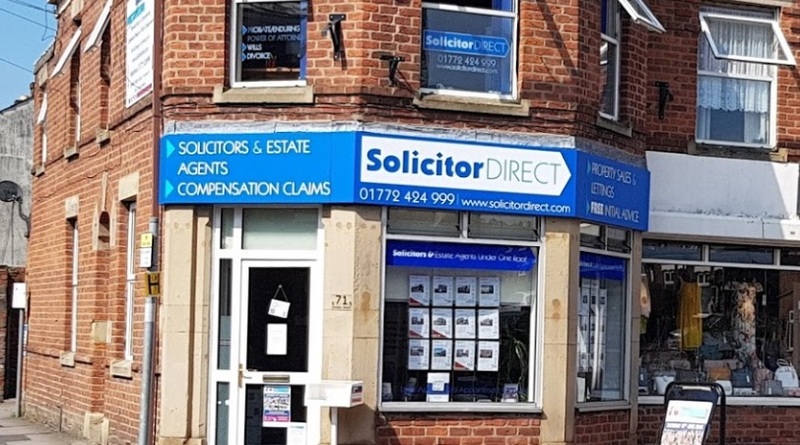 At Solicitor Direct we aim to provide high quality and professional legal services and estate agency services that are affordable. For more information contact us today. You can rely on Solicitor Direct’s professionalism and expertise in resolving your legal issue whether you have a problem for you Personally or a Business matter. FREE ADVICE – We offer free initial advice service just call us. We are an Established Firm of Solicitors, Estate Agents and Lettings Agents offering a full range of legal services and full range of estate agent sales and lettings services. We pride ourselves with a reputation founded on Quality, Honest and Approachable advice without the Premium Cost. As Solicitors and Estate Agents based in Leyland we offer our legal services to the whole of England and our Residential Estate Agent services & letting services to Leyland, Preston, Chorley & Surrounding areas. Solicitor Direct have been established local solicitors since 1996 and offer a full range of legal services you would expect from your local solicitor in Lancashire. Take advantage of our FREE initial legal advice available over the telephone or in person if you prefer. We are Leyland based solicitors but offer our services across the UK. Looking for an estate agents or letting agent in Leyland or Lancashire? At Solicitor Direct we offer the full range of range of property services including house sales, purchasing, valuations, conveyancing and more. Having Solicitors and Estate Agents under one roof the service is simple, effective and focused. To contact Solicitor Direct today, simply call us, visit us, email us or fill in our contact form (right hand side) and a member of our team will be in touch.